This is the third in a 4-video series on CHIP. In case you missed the first two: What Is the Optimal Diet? (http://nutritionfacts.org/video/what-is-the-optimal-diet) and The Weight Loss Program That Got Better with Time (http://nutritionfacts.org/video/The-Weight-Loss-Program-That-Got-Better-with-Time). Stay tuned for A Workplace Wellness Program that Works (http://nutritionfacts.org/video/a-workplace-wellness-program-that-works). I’m looking forward to writing a whole book on evidence-based dietary approaches to mental illness. Stay tuned! Have a question about this video? Leave it in the comment section at http://nutritionfacts.org/video/chip-the-complete-health-improvement-program and someone on the NutritionFacts.org team will try to answer it. Want to get a list of links to all the scientific sources used in this video? 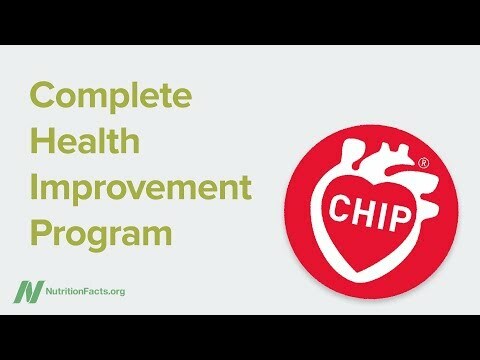 Click on Sources Cited at http://nutritionfacts.org/video/chip-the-complete-health-improvement-program. You’ll also find a transcript and acknowledgments for the video, my blog and speaking tour schedule, and an easy way to search (by translated language even) through our videos spanning more than 2,000 health topics.